Auburn did fine in ’59 … Auburn 33 – Kentucky 0. Art via the always awesome WeagleWeagle.com. Late-night UPDATE from Jerry: Just ride the lightning, folks. No, it was not a thing of beauty. At least, not on the whole; certain parts of it–the offense’s first half, that final incredible amazing absolutely f***ing epic drive–were as beautiful as anything Auburn’s done since Tubby’s salad days. But not on the whole, not when the offense puts up 37 points and more than 500 yards on the road in the SEC and still needs Byrum on the final play. That’s now 4 wins in 4 tries in games decided by one score, and eventually the other shoe’s going to drop. But who cares? It might drop next week, maybe next month, maybe not until next year or even a few years. The important thing tonight is that Auburn played on the road, against an SEC team, a team that’s frankly a terrible matchup for us–we have no idea how to handle quick-n’-shifty guys or short passing games, and no one does quick-n-‘shifty and short passing like Kentucky, not to mention they commit more fully to cutting off Malzahn’s deep shots than just about anyone–and won. Our Tigers are 6-0. Our quarterback is a wonder and a joy. Our team still has room for improvement, starting against Arkansas next Saturday, and (importantly) they know it. So things are good. Very, very good. The lightning is still snug beneath us. I’m just going to keep on riding. Fulltime. We know this team can come from behind at home. We know they can dominate at home. And apparently squeak by on the road to two up-and-coming SEC programs. Whew! Kentucky gave the Tigers everything they had in the tank. There were a few failings that we could point to tonight. But you got to focus on that last game-winning drive. This team had been in the position before and was all “Pffft. Whatevs.” and drove 88 yards in 19 plays (and time kept on ticking ticking ticking into the future for more than seven minutes) for Wes Byrum to coolly kick it through the uprights for a win and an Auburn record-breaking field goal. This team just knows what to do to win so far. Now, how about holding down that big lead …. hmm? What a day of football in the SEC. But after the dust cleared, the Auburn Tigers and LSU Tigers are on top of the SEC West. Great. The next two games are going to land those of us prone to anxiety in a ward. Glad our defense decided to get off the bus halfway through the first quarter. The UK fans are incredibly welcoming and friendly. Much like their defense. Walt is sounding off from Kosovo in the comments below. Our Tigers are scoring at will. Two horrible personal foul calls against Ethridge pretty much helped the Wildcats with a score against Auburn. What else can we expect from our Cam? Another 4 TDs in the second half? Godzilla is amazing. Who about that off balance throw to Burns in the second quarter? I thought it was the dumbest ever decision as soon as the throw left his hands … and then it was brilliant. Gametime, 7:10 p.m. CDT: Awful news out of Auburn tonight folks. The Plainsman reports that James Foy died last night at the age of 93. Here is the AP story. Post any thoughts or remembrances in the comments below. Here’s a collection of photos and a video from last year of Dean Foy. Pregame, 5:55 p.m. CDT: I sez: THE LONG NATIONAL NIGHTMARE IS OVER!!!! My favorite part? (Well, one of my favorite parts.) The entire Bama squad had the sun in their eyes on the sideline for at least 40 minutes. The rest of the stadium was in shadow. It was like a spotlight in a dark room. Let’s put some more pressure on ’em and win tonight Tigers!!! Inside lovely Cam Newton Field. Oh, wait — it’s actually C.M. Newton Field. FOR THE MOMENT. Pregame, 5:40 p.m. CDT: Like most of you … I’m glued to the Gamecocks vs. Crimson Tide game. It was beginning to feel like a certain game in Auburn last year. 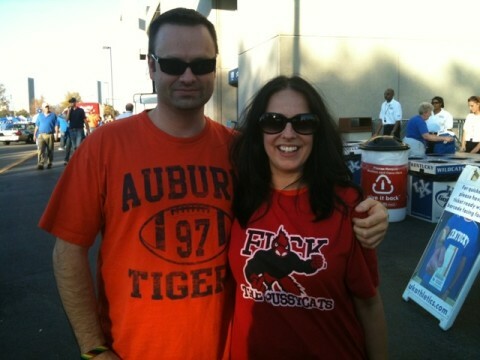 Louisville and Auburn fans join forces to hate on Kentucky. Is it turning ugly already?? Van says: The player entrance 45 minutes (!!) before Tiger Walk. 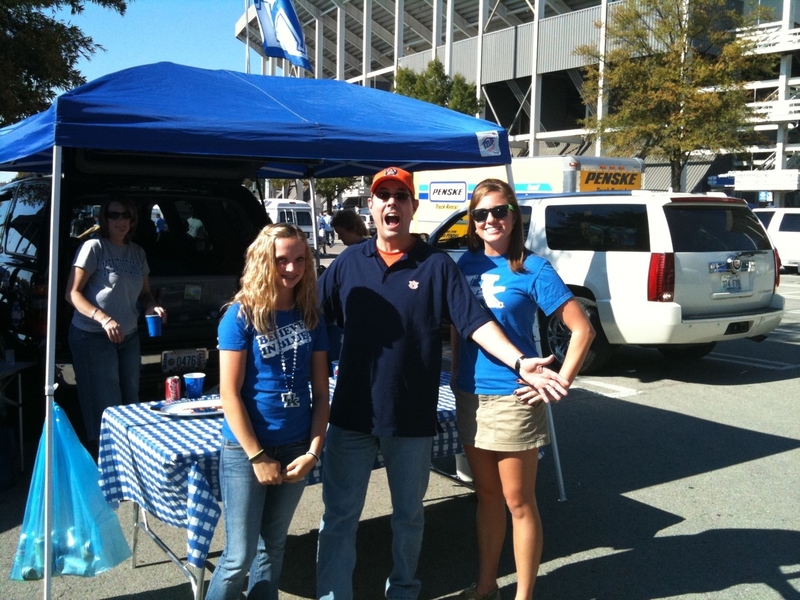 … The Kentucky fans are frightened and confused by the delirium we AU fans are exhibiting as we watch SC hammer the Tide. 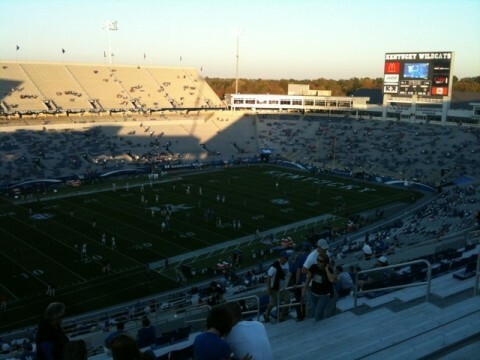 At a UK tailgate party, 330 pm [EDT]. The UK fans seem hopeful but realistic. Awaiting Camzilla arrival. Pregame, 2 p.m. CDT: Smilin’ Jack wants to know something, Auburn fans. Are you for Auburn? STAND UP FOR AUBURN!!! 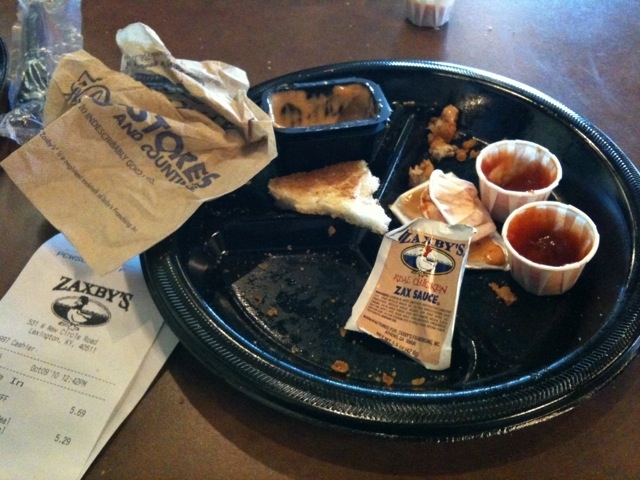 Pictured here are the grim remains of our all-too-rare Zaxby’s meal. [– Ed. Note: Click photo for TWER’s EagleVision of the remains.] Living in Illinois, we don’t get to experience the joy of real Southern-style chicken fingers very often. Pregame, 7:50 a.m. CDT: Good morning sleepyheads! It’s great to be an Auburn Tiger! The early eagle gets the worm! 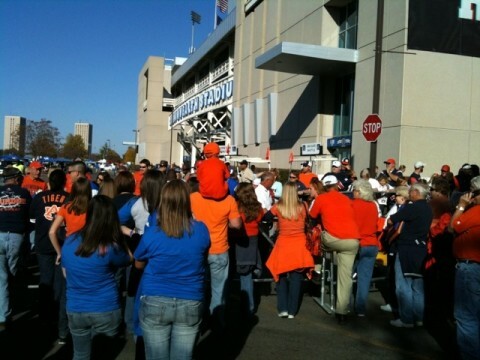 Ol’ Kentucky Home for Col. Aubie? The Auburn Tigers haven’t lost in Lexington since 1966. The weather looks fantastic tonight in Lexington: 75 degrees at kickoff and dropping down 10 degrees by game’s end. We’ve got the boys from The Wishbone at the game and they’ll be checking in from time to time. We might have an appearance from your friend and mine, WarBlogEagle’s Jerry. If anyone is going to the game here’s a link to the Tiger Walk map. It’s happening at Gate 9 at Commonwealth Stadium at 5:30 EDT. The guys on ESPNU’s “1st and 10: College Football Edition” just predicted and Auburn win, 31-14. I’ll take it. Our main man Justin came through in the clutch and offered his Kentucky preview. It’s setting off a firestorm of debate about the dangerousness/lack-of-claws? of the Kentucky offense. Great read. It will put a fear in you though. Not for the faint of heart. Our football champion, our co-captain here at TWER, Jerry, checked in and offered a couple of thoughts on the game tonight. More in a bit. 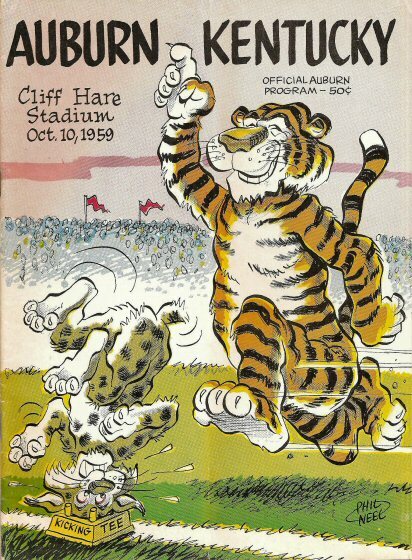 Loved the program cover….I was a brand new freshman at AU and was at thsi game. 50 Cents for the program…my how times have changed. I think game tickets for student were a buck too. War Eagle! 4:10pm in my part of the world. I’ve still got a bit of sleep between me and the game early tomorrow morning. Should be a good one; I’m predicting a comfortable victory for the Tigers tonight. Not exactly dominating, but comfortable. But I’ll take dominating, too. 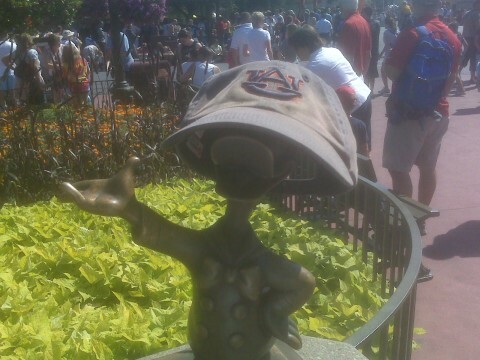 Walt, we’re due for a comfortable/dominating performance against an SEC foe. Why not tonight? AU64, any remembrances from that game/day? Thanks for the mention. Kick’en myself for not planning a trip to Lexington this year for the game. Yeah … Lexington is about 8 hours from Baltimore. I thought about it too. 8:30pm Kosovar time. Going to sleep so I can get up at 1:30am for the game. Y’all pregame hard for me since I can’t have anything to drink over here! I love you Steve Spurrier. “#2 for Auburn is going to touch the ball a lot.” Bob Davie… I hate you. What a throw and catch to Kodi!! And Bob Davie doesn’t think Kodi has caught a pass all game? Ummm, were you paying attention a bit ago? We’re getting screwed on personal foul calls tonight. That’s two against the defense that are a load of crap. Make that 3. Wow, these refs are horrible. Why did we just burn the redshirt on Clark??? Probably because Shoemaker has been seriously inconsistent. Of course, Clark didn’t look too great there, himself. And have I mentioned how much I can’t stand Bob Davie? Wow, he’s got to be one of the worst announcers EVER. Where did our defense go? They’re getting gassed in this half so far. I’m sick and tired of the “what if Cam Newton had stayed at Florida?” “Can you imagine Florida with him at QB?” comments. He’s an Auburn Tiger, now. Accept it. LOVE it. Alright, I have to admit. I was wrong about this game. I made a bad assumption that Mike Hartline was going to be Kentucky’s quarterback. Apparently Randall Cobb is the QB for this UK team and it has changed everything for them. This game absolutely was a trap game… effin’ Cobb is 5x as effective at QB than he is at WR. And that should have been 15 yards against Kentucky for the defensive player spiking the ball after it went out of bounds on the fumble. Stepping out of bounds right there could bite us in the hind-end if it gives them more time after this drive. We need another 1st down here to put it away (and another clutch Foot Lauderdale FG (or, you know, a TD run)). 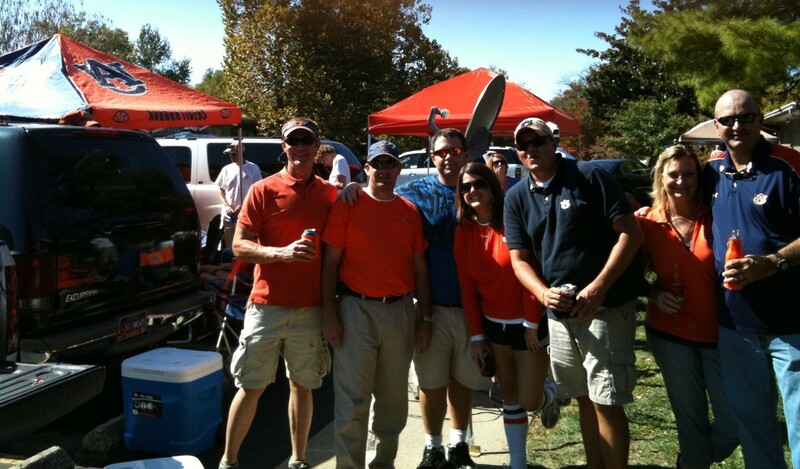 WAR EAGLE!!!! Wow, that looked entirely too much like last year: jump out to big leads, and then let the other team get back in. We lost 2 big games last year doing exactly that. But 37 is more than 34, and God2illa rolled to an EXCELLENT game. On to the next one, Tigers. Now I’m going back to sleep. I can get almost another 2 hours before having to get up for my Sunday. Back in the hotel room, 1:30 am local time. Mentally drained. Even the horde of UK fans around us admitted the refs were full of it. I’m sure they’ll enjoy those UK season hoops tix they must have been promised. Sheesh. ‘Night, all. Heading out of Lex-town in just a few short hours. Our work here is done. About the “lull” in the 3rd quarter… It seemed like Auburn had a somewhat comfortable lead, and the coaches wanted to dial down the offense to avoid Cam getting hit. The play calling seemed designed to take the ball out of his hands and see if we can keep moving the ball without Cam running every other down. Obviously, that didn’t work out so well. A 50 yd kick return and what seemed like five plays of exactly ten yards each later, I knew we were NOT in for the relaxed evening some had predicted. Making it worse was the thought that a loss would provide some measure of salve for bama fans– a prospect I found nauseating at best. So that ended up being a HUGE win– bigger even than I expected on Sat morning. And everything else aside, we DID it. 1) We had a chance last year against UK at home, with plenty of time- to drive down and make the game tying touchdown. And what did we do? Like 10 OL and formation penalties . FAIL. Last night, a 7:22 drive that could have/should have ended with newton dragging folks into the endzone. But that would have given UK time to gash us again, so we settle for the FG. 2) At least 2 of UK’s TD’s were hugely aided, if not downright gifted to them by bad kick off and coverage (our fault), but more so with HORRIBLE officiating. To the point where I hope some poor grad assistant was up all night from the time the charter landed til now, preparing the tape that will accompany a letter to the SEC office. Please tell me how riding a guy from 2 yards in bounds, to 3 yards out of bounds– is a late hit? The Fairley one early had no real impact, but how do you hit a guy (not in the helmet) while he is releasing the ball, and THAT is a roughing the QB? 3) I believe this was the last shifty back offense we have to face (right?). I hope to never see Cobb/Locke ever again. Just like last year, when I was glad that Noel Divine would never take the field against us again. 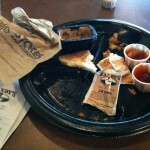 Finally- -I read that Eltoro didn’t make the trip. Any update on that? A win is a win. 6-0, plenty of opportunity and time to improve, with our next two toughest games at home. OK, it’s 10:00 pm Sunday and I just got back to Auburn from UK, so I’ll keep this short. 1) Impressive 1st half and final drive, but 37 minutes of football doesn’t cut it. That is the single most glaring problem (and encouragement) with this team. They have yet to play a full game, and if it’s not fixed, it will bite us. 2) Cam Newton just about single-handedly won that game at the end. Every UK fan I ran into after the game was in awe. 3) The most telling thing about the game to me was after the TV cameras had turned off. The Auburn players came towards our section and started celebrating with the band, with the exception of one notable person: Josh Bynes. He was walking towards the tunnel, head down, and generally angry. It made me unbelievably happy to see this, as one of our senior leaders looked as if he immediately understood that we were fortunate. 4) I cannot remember winning on a late FG and not really cheering. Instead my friend and I looked at each other and just exhaled. There was very little celebration outside of the stadium from most AU fans. 5) Bama lost, we won, and in the end, we are atop the SEC and in the top 10. It’s hard to complain too much, but we absolutely need a lot improvement with consistency to be a championship team. Started out Saturday by hitting a football-viewing party at a friend’s house. Said friend used to repair video games and pinball machines for a living and now has a small arcade (~35-40 machines) in his basement. Wings, keg beer, and Donkey Kong, Ms. Pac Man, etc. to start the day off, nice! 2:30 rolls around and of course, everyone’s glued to the tube to see Bama blast Sakerlina into the next dimension. About an hour later, I had to hide the smile on my face seeing the disbelief on the Bama fans’ faces. Ended up having to leave at half due to mandatory attendance at a wedding. Was monitoring the game on the iPhone and thought that Bama was gonna pull off the comeback when they made it 27-21. Checked the score as the wedding was ending and it was 35-21 with about a minute left, wow! Then I had to tell myself not to gloat, because of the karmic bitchslap that I might be inviting concerning our game. Imagine my surprise when, checking the score at the reception, I see we’re up 24-7 about halfway through the 2nd. It was a bit of a letdown to let them get 10 more points, but 31-17 is still a comfortable score at half. Then the WTF factor set in when I get home and turn on the game to see 31-24 turn into 31-31 to end the 3rd quarter. I can haz defense, plz?! I can haz 1st-half offense, plz plz plz?! Needless to say, my fingers are still hurting from chewing my fingernails off there at the end. Two words kept me believing to the end though: Cam Newton. Okay, plus two more words: Wes Byrum. Echoing Brad’s post just a bit, it would be nice to get a full, complete game from both sides of the team. I’d love it if we could do it for the next 5 games, then have a completely dominating game to win the Iron Bowl. And like he said, I guess it’s hard to complain too much, being undefeated and ranked #8. And oh yeah, a certain rival ain’t #1 any more.